As Superstorm Sandy battered the U.S. East Coast in 2012, residents in communities along the Connecticut shore received “mandatory” evacuation orders, but most people didn’t leave. Our new study, “Hurricane Attitudes of Coastal Connecticut Residents: A Segmentation Analysis,” provides insights into why some people decide to evacuate in the face of a weather emergency and why others try to ride out the storm. 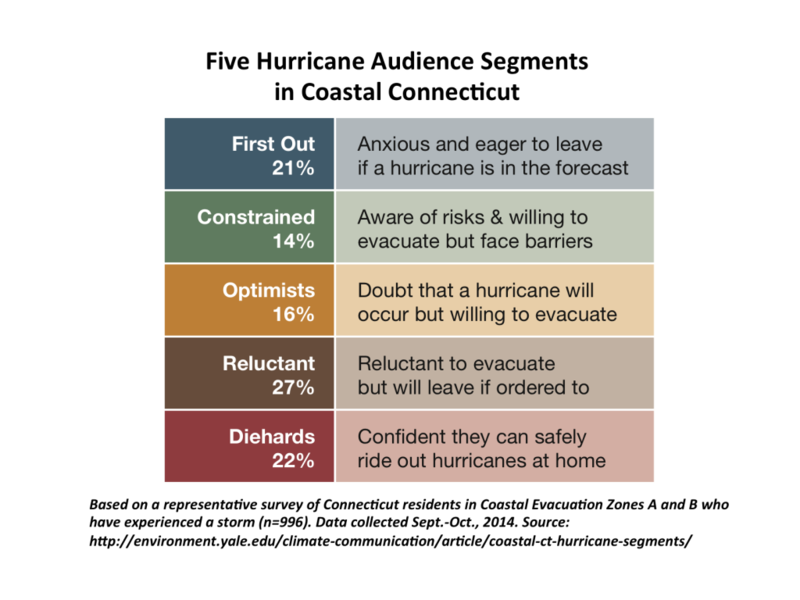 The report identifies five distinct groups of CT coastal residents based on their attitudes towards hurricanes: the “First Out” (21% of the population); the “Constrained” (14%); the “Optimists” (16%); the “Reluctant” (27%); and the “Diehards (22%).” The First Out are the most likely to evacuate during a hurricane whereas the Diehards are the least likely to leave. Each group, however, has unique characteristics. The Constrained understand the risks of staying home during a hurricane, but feel they would have trouble evacuating if they wanted (or needed) to due to poor health/disability, pets, or lack of money. 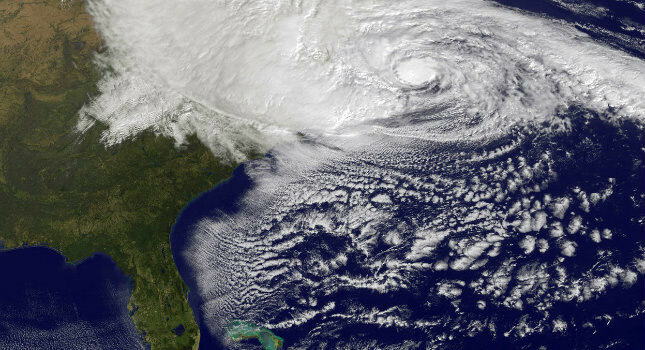 22% of the Constrained evacuated during Superstorm Sandy – the highest proportion other than the First Out segment. The unique perceptions and needs of coastal Connecticut residents in the event of a hurricane underscores the importance of tailoring messages about storm preparedness, the nature of storm hazards and the likelihood of different damages, as well as evacuation resources. Some groups understand the risks and need minimal information in order to respond appropriately, whereas others understand the risks but need assistance. Still others misunderstand the risks and thus require education and outreach efforts well before a hurricane makes landfall. A better understanding of hurricane attitudes is needed to improve communication efforts in the emergency management community. "I do not want people to endanger themselves in a possible rescue attempt." "Next time I may think of leaving cause it was pretty bad!" Why did one "Diehard" stay home during Sandy? [Because I was] "prepared with generator and precooked food." This study of hurricane attitudes is based on data from a representative survey of 1,130 households along the Connecticut coast described in our first report, Hurricane Perceptions of Coastal Connecticut Residents released March 20, 2015. Funding for this project came from the Coastal Storm Awareness Program (NOAA awards NA13OAR4830227, NA13OAR4830228, NA13OAR4830229) at the National Sea Grant College Program, National Oceanic and Atmospheric Administration, U.S. Department of Commerce, with additional support from the Energy Foundation.